Professional Juggler, Foot Juggler and Clown. Ideal entertainment for corporate functions, festivals, outdoor events, shopping centre feature spots and similar events. Since she can remember Hazel has always loved being on stage. A favourite with children of all ages. She has performed her amazing acts at the Crown Casino, The Melbourne Town Hall and countless festivals and corporate events around Australia. She has recently graduated the National Institute of Circus Arts with Australia's first Bachelor of Circus Arts qualification and received the 2002 Commitment to Excellence Award. - special events coordinator, the Hilton Melbourne. Hazel demonstrates her talent for balancing flipping and spinning large objects with her feet including: a Table, Pipe and Seven Hula-hoops all this while narrating the action in comic alien gibberish. Incorporating her own unmistakable clown style to create an unusual and visual act. Combining her unique style and her unusual flexibility in to a flowing and highly skilled routine including balls rings and clubs. 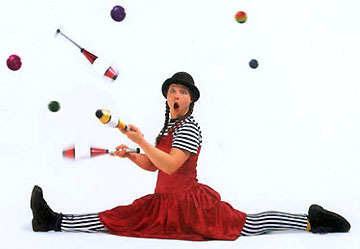 Juggling up to seven objects at once she is one of the best female jugglers in Australia. Matilda is the spirit of nonsense. In this act Hazel frees the natural clown within using characterization which is subtle and non-threatening especially to little people. Including skills such as juggling, mime, magic and stilts to create a roving character that will bring colour and fun to any setting.